Becoming a pyrotechnician sparks interest in people who love firework displays. Learn what it takes to enter this exciting field. A pyrotechnician is responsible for the safe handling, storage and design of pyrotechnic devices. This professional may provide services for a number of different types of events, including sporting events and concerts. The job requires skill, experience and licensure. Each state has rules and regulations to consider, and local, state and federal agencies regulate the fireworks industry rigorously. The process of becoming a pyrotechnician is long, and it does require tenacity and patience. Safety is of the utmost importance, which can make earning a license challenging. Those who stick with a program for a considerable amount of time gradually earn enough experience and skills to gain licensure. While many states allow people as young as 18 to work on fireworks display crews, some states require all crew members to be at least 21 years old. The age requirement depends on the specific state in which you earn your license. All states requires managing display operators to be at least 21 years of age. As an apprentice, you begin your journey to becoming a pyrotechnical professional. On the job experience is a critical part of building skills, and working beside experienced workers is a great way to learn the ins and outs of the field. In an apprenticeship, you work with the display operator managing the event. The display operator evaluates your safety practices, your adherence to regulations and your overall performance. After successfully following through in at least three firework shows, an apprentice may be able to move on to getting a license. Before entering a pyrotechnical apprenticeship, you will be required to pass a drug and alcohol test. Working as a pyrotechnician requires sharp attention and quick responses; drug and alcohol problems can interfere with your ability to do the job safely. Criminal background checks are also a requirement to become a pyrotechnician. 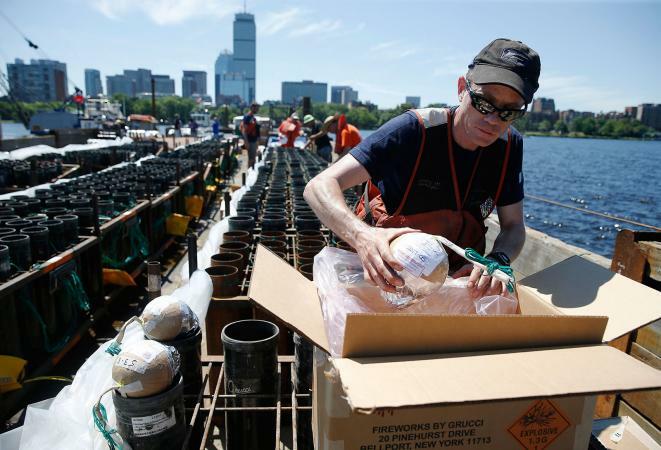 The entire clearance process can take one to three years to complete, according to the American Pyrotechnics Association. Apprentices move on to become licensed professionals and display operators. Some state require operators to have a hazmat endorsement with a commercial driver license (CDL). States that require licensing may also require you to complete testing, and to pay an annual fee for licensure. Pyrotechnical workers are small in number, and many choose to enter this field to supplement a full time income. The job offers many exciting opportunities for travel in this unique splinter of the entertainment industry.